Your shoulder is a complex structure, comprised of four rotator cuff muscles, which form a connection between the shoulder blade and humerus (upper arm bone.) There are three rotator cuff muscles located on the posterior or back side of the scapula (shoulder blade). These three rotator cuff muscles are called the supraspinatus, infraspinatus, the teres minor. The fourth and final rotator cuff muscle is called the subscapularis, which is situated on the front (anterior) side of the scapula (shoulder blade). Below the muscles of the shoulder — called the glenohumeral joint — you’ll find ligaments, bursa, connective tissues and bone. There’s also a rim of cartilage called that sits around the labrum — the socket-like structure that accommodates the ball at the end of humerus bone. It doesn’t envelop the ball at the end of the humerus as you see with the ball-and-socket joint that is your hip. Dead-hang pull-ups and overhead presses are two common isolation exercises that are used to strengthen the rotator cuff muscles. But the shoulder is a complex structure and as such, it’s essential to use the proper exercises to strengthen your shoulders, without causing damage to the fragile labrum or rotator cuff muscles. In fact, labrum injuries are very common among those who take part in CrossFit training exercises. Poor technique is often the cause of many joint injuries, including muscle strains and pulled muscles, swelling, impinged tissues and beyond. But in my experience, it’s the kipping pull-up that places you at the highest risk of sustaining a dreaded labrum injury. Some CrossFit training enthusiasts — it’s often the new and less experienced CrossFitters — will perform tons of kipping pull-ups, followed by a dead hang and that’s when you run into troubles involving labrum injuries. The reason? Often, the individual has poorly developed arms and shoulder muscles which simply aren’t strong enough to pull up the person’s full body weight. So instead of dead-hang pull ups — which require more strength — they resort to a kipping motion in order to get the job done. The problem with kipping is that you’re over-working and straining muscles that aren’t sufficiently strong yet. You’re adding a forward and downward momentum to the equation, plus there’s you’re full body weight. The momentum actually compounds the situation, so that the muscles must endure more than just the stresses of supporting and lifting your body weight; the momentum adds to the equation so your arm and shoulder muscles, along with the fragile labrum, are subjected to stresses that far exceed your body weight. Stated in a different way, with a kipping pull-up, your arms and shoulders must endure acceleration as they lift your body; then your body must absorb the deceleration as you lower your body. Conversely, with a dead-hang pull, it’s only a matter of lifting and lowering your body; there’s no acceleration and deceleration involved. 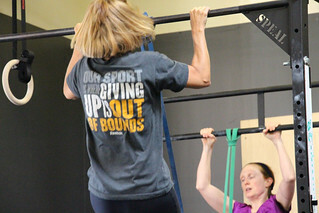 The momentum associated with kipping pull-ups places an added strain that creates a recipe for injury. What’s worse is many CrossFit enthusiasts fall into a sense of false security because they’ve performed kipping pull-ups in the past without suffering any injuries. The body is an incredible structure and it can handle forces that far exceed what it can safely handle. As you tire and repeatedly tempt fate, so to speak, you increase your risk of sustaining an injury. Ultimately, the well-oiled machine that is your shoulder ultimately falls victim to the abuse, suffering an injury because you’ve subjected it to forces that are greater than what it was designed to handle. It’s a bit like driving your car at 110 miles per hour for hours at a time each day. While your car has the ability to travel at 110 MPH, it’s not designed to operate at this speed for long periods of time. Continue to drive your car in this way and you’re going to end up with a serious problem. The same goes for performing kipping pull-ups when you don’t have the strength to perform dead-hang pull-ups. They’re among the most common causes of labrum injuries in CrossFit enthusiasts. Now, it’s important to note that kipping isn’t entirely bad, when done properly. Kips should not entail a wild swinging motion that causes pain; they should be a controlled movement It’s important to remember that kips should never be done instead of dead-hang pull-ups; it’s best to do them in addition to dead- hang pull-ups. If you have the strength to perform at least half a dozen dead-hang pull-ups, then kips can serve as a safe and effective workout option. If you still need to strengthen your shoulder and arm muscles, then you can use other, safer training options, such as bands, weights and other alternatives. injury, especially in cases where it’s a serious injury that requires surgical repairs. So don’t risk injury! Work with an experienced trainer who can help guide you as you work to achieve your fitness objectives!